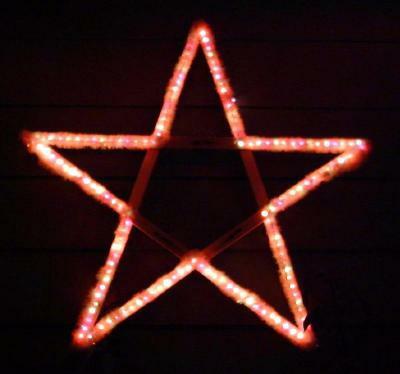 This star was the first original outdoor decoration that Tim ever created. Sometime in the late 1980’s when he was in high school, the 8-function computerized “magic” lights first became available. Tim decided to buy a set and create a star for his parent’s display. The star is really quite simple to construct, although a bit tedious. Tim used 5′ lathe boards for each segment, and fastened them together, then determined a bulb spacing for the perimeter of the star, and drilled 140 holes into the boards. Each hole is slightly smaller than the bulb base, which allows the bulbs to be pushed into the hole so that the glass part emerges to the front, but the base stays snugly in the frame of the star. As a final touch, white garland fastened with push pins was used around the perimeter to give the lights more of a diffused look. The star continued to be used it Tim’s mom’s display for about 30 years. Along the way the garland was replaced, and the multifunction lights were replaced with LEDs. Below is a picture of my Tim’s mom’s display circa 2001, which Cathy and I put up over Thanksgiving for many years, until she passed away in 2017.